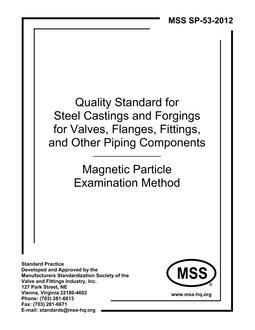 1.1 This Standard Practice provides methods and acceptance standards for magnetic particle examination of ferritic steel valves, flanges, fittings, and other piping components by use of dry magnetic powder or wet magnetic particles. 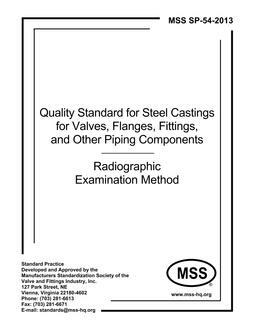 It is applicable to the examination of repairs and the initial examination of castings and forgings. 1.2 The methods contained in this Standard Practice provide uniform procedures that will produce satisfactory and consistent results upon which the acceptance standards of Table 1 may be used. 1.3 This examination guide may be used on a voluntary basis or when specified in an inquiry, contract, or order and when mutually agreed upon by the manufacturer and the purchaser. 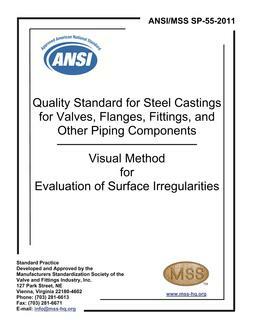 1.4 This Standard Practice includes the examination of pressure containing castings and forgings.